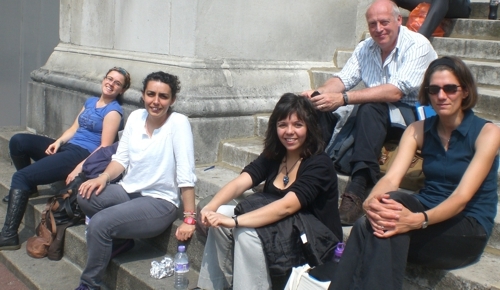 Particpants on the Numerical Analysis course 2012: Lottie Miller, Guiomar Sanchez, Maria Rubio, John Douglass and Sonia Jaehnig (left-right). Photo courtesy of Manuela Milan. Last month I attended the Numerical Analysis of Biological and Environmental Data course at University College London (UCL) in order to decipher which techniques of multivariate data analysis would be useful to apply to my data from Lake Bosumtwi (Ghana). The course was led by Dr Gavin Simpson (UCL) and Prof. John Birks (University of Bergen), both of whom are well experienced in quantitative palaeoecology. The course provided an introduction to the methods, guidance as to when to use the techniques and then outlined the assumptions, limitations and strengths of the various methods. The need to fully understand the techniques applied before attempting to critically evaluate the results was also strongly emphasised. The course consisted of lectures covering measures of dispersion, cluster analysis, dendrograms, regression analysis, tree models, gradient analysis, transfer functions, time series and hypothesis testing. Afternoon practical computer classes involved using R, C2 and CANOCO to implement the various techniques covered in the lectures. Overall the course was a great introduction to statistical analysis which I would certainly recommend for anybody working with complex and noisy datasets. In the next few days I will be using my newly learnt R skills to run indirect gradient analysis such as PCA, CA, DCA and NMDSCAL to search for environmental gradients within my data. Numerical Analysis of Biological and Environmental Data training couse is an annual event and was held at UCL, on 14-25th May 2012. For more information about the course see Gavin’s website or read his blog From the bottom of the heap.